This cocktail table will help you to create a feeling of relaxed style inside your living room. It is designed to be stylish without looking stuffy and accomplishes its task with a rich, merlot finish over birch veneers. English dovetails add quality to the piece while keeping it affordable and casters bring an added element to the base. Details include brushed nickle drawer pulls which allow you to open the drawers when seated on either side of the piece. The Merlot Castered Cocktail Table with 2 Pull-Thru Drawers by Jofran at Simply Home by Lindy's in the Hickory, Morganton, Lenoir area. Product availability may vary. Contact us for the most current availability on this product. Finish & Paint Options Available in finish option(s) shown. Handles & Hardware Silver knob pulls, selected for casual style. Case Detail Straight legs for a casual style with beveled accents. Storage Two pull-thru drawers that can be opened from either side of the table with one shelf below. Description: Top Smooth finished table tops with beveled detailing. Case Construction Made of birch veneers with English dove tail joints for strength. This living room table collection features casual elegance with just the right amount of beauty. We want our homes to be fashionable but many of us also desire a space that is livable, where guests can kick-off their shoes and have a seat without feeling like they might disrupt the "look" of the room. This living room collection is designed for just that - creating a fashionable style with a relaxed ambiance. 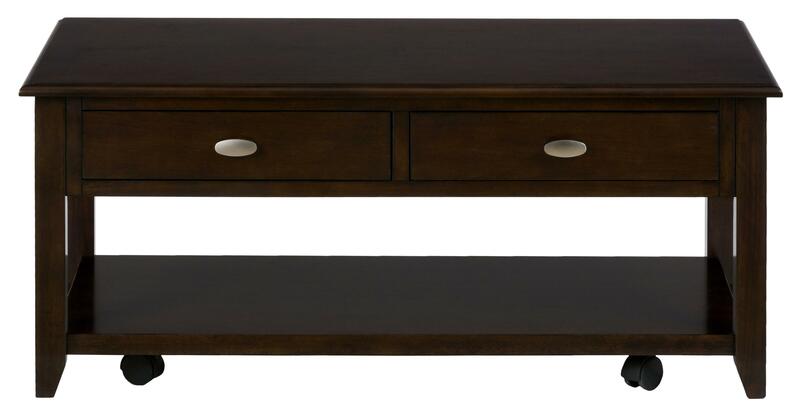 Placed at an affordable price-point, this group is made of birch veneers beneath a merlot finish. English dovetails enhance the quality of the items while still keeping them at an affordable price-point and nickle drawer pulls add detail to the group. 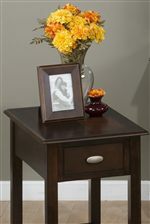 The Merlot collection is a great option if you are looking for Casual furniture in the Hickory, Morganton, Lenoir area. Browse other items in the Merlot collection from Simply Home by Lindy's in the Hickory, Morganton, Lenoir area.